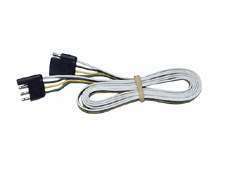 Home Towing AccessoriesElectricalWiring Connectors4-Way Flat - Bonded Loop - 12"
4-Way Flat - Bonded Loop - 12"
Cut to your specific length or use as an extension. Often used to add length between your T-Connector and Trailer. Heavy gauge bonded loop 12" length.